Organs involved and pulmonary air volumes. Transport of CO2 as carbonic acid and as bicarbonates. The process by which food is oxidized in the cells to release their bond energy for utilization in the body is known as respiration. Complete oxidation of carbohydrates producing carbon di oxide, water and energy. Anaerobic – without oxygenIncomplete degradation of substances and release of carbon di oxide, organic compounds like ethyl alcohol, lactic acid etc. and energy. 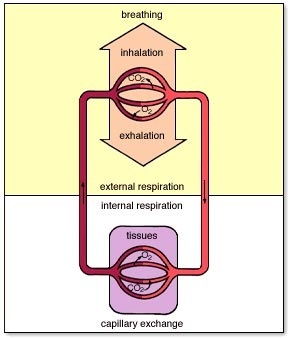 The process of respiration involves two phases- External and Internal respiration. External respiration involves uptake of oxygen from the environment and elimination of carbon di oxide in the same medium. This is a physical process that depends upon the principle of diffusion. Internal respiration is a physico – chemical process in which energy is produced. Internal respiration involves oxygen uptake by the tissues, oxidation by enzymes and carbon di oxide elimination from the tissue cells. The exchange of gases between the cells and the extracellular fluid and also between animal and the surrounding is based on the principle of diffusion.Gas diffuses across a membrane from the side where its partial pressure is higher to the side where its partial pressure is lower. A respiratory surface is needed, with large surface area, thin, highly vascular, permeable to respiratory gases etc. 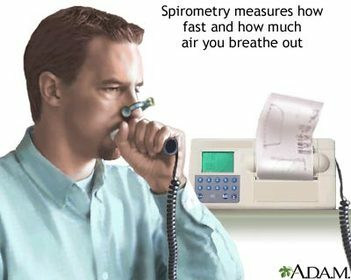 To meet all these needs complex respiratory systems have evolved. 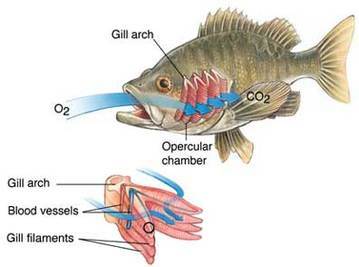 Lower animals take the gases directly from the medium and give out to the medium this is called direct respiration. 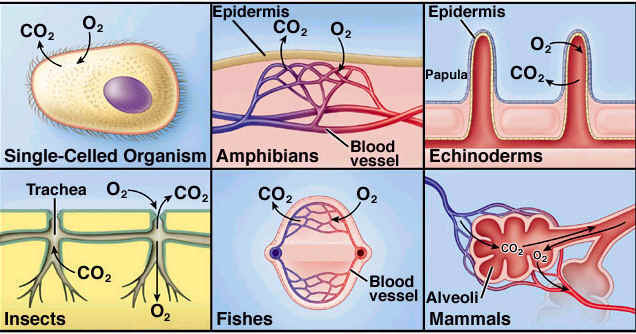 The higher organisms require respiratory and circulatory system, thus is referred to as indirect respiration. 2. Filtration- Hairs trap large dust particles and mucus traps small dust particles. 3. Cleaning- cilia vibrate in opposite direction to inhaled air and keeps the passage clean. 4. warming- the blood supply warms or cools the air to bring it to body temperature before entering the lungs. 5. Smell- olfactory receptors detect smell. 6. Sterilisation- Adenoid cells of pharyngeal tonsils kill bacteria. 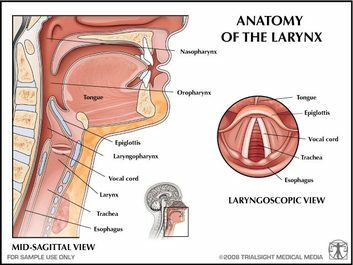 The opening of the pharynx into the trachea is called glottis and is guarded by cartilaginous flap the epiglottis. 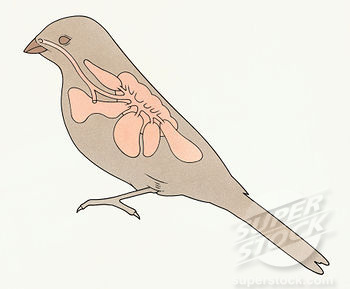 During swallowing the epiglottis closes glottis and keeps food out of the respiratory tube. 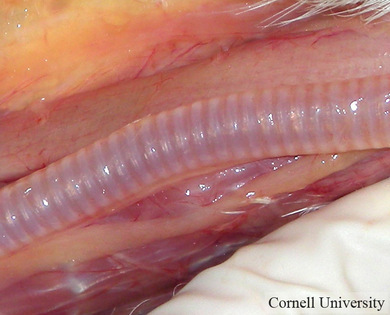 It is the upper part of the trachea, formed of four cartilages, two sets of muscles and two pairs of vocal cords. 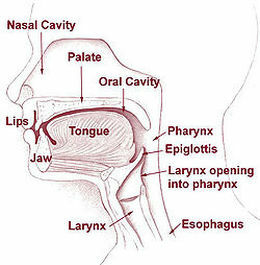 The vibrations of the vocal cords produces voice. 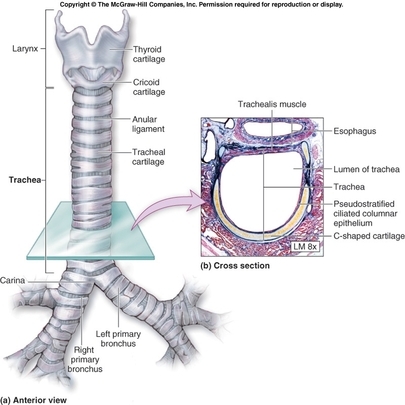 Trachea extends from the larynx to the bronchi in the thoracic cavity. It is 11 cm long and 2.5 cm in diameter. The trachea is supported by C- shaped cartilagenous rings. These prevent the collapsing of the trachea. The trachea divides into two primary bronchi, that enters the lung and divides into secondary and tertiary bronchi. These branch into bronchioles- terminal and respiratory. 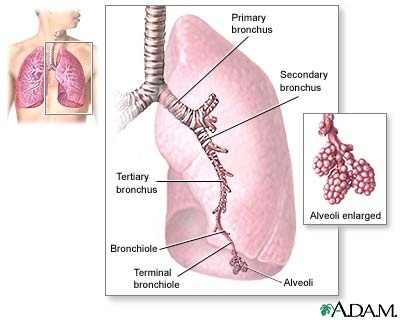 The bronchus with its branches is called as the bronchial tree. The trachea bronchi and bronchioles are lined by pseudostratified columnar epithelium containing ciliated and goblet cells. The goblet cells secrete mucus- entangles dust particles that enter with inspired air. 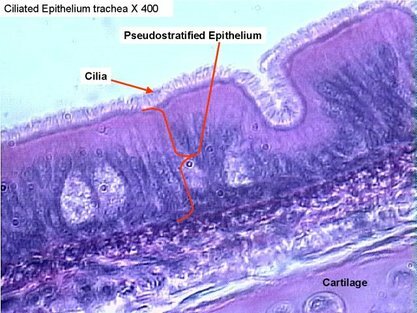 The cilia push them upward into the pharynx. the terminal and respiratory bronchiole lack goblet cells. Lungs are a pair of conical, elastic hollow bag-like organs. The slit through which the bronchus enters is called hilum. 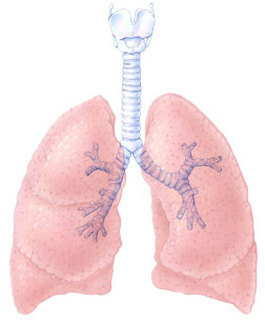 The right lung is larger and has three lobes whereas the left lung is smaller and has only two lobes. 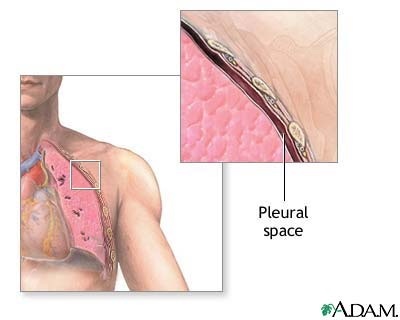 The lungs are enclosed by a double layered membrane called pleura. The membranes are separated by thin space filled with pleural fluid. The membrane that covers the lungs is called viseral pleura and the membrane lining the cavity is called parietal pleura. Dead space - The volume of gas taken into the lungs, which does not contribute to gaseous exchange. 2. Exchange of gases on the alveolar surface or external respiration. 4. Exchange of gases in the tissues or internal respiration. One inspiration and one expiration alternately is called respiratory cycle. 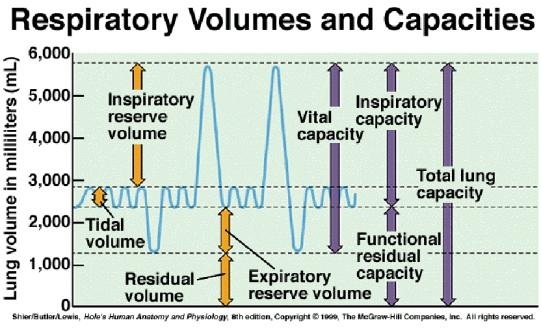 Rate of respiration is expressed in terms of ventilation rate. Average- 12 to 14 times. External intercostal muscles contract to make the ribcage move outwards and upwards. Radial muscles of the diaphragm contract to make diaphragm flat. Volume increases and pressure and pressure decreases. Internal intercostal muscles contract so that ribcage moves downwards and inwards. Volume of throracic cavity decreases and pressure inside increases. Breathing is controlled by a poorly defined group of neurons in the brain stem called the respiratory center. The components of this center are widely scattered throughout the pons and medulla oblongata. However, two areas of the respiratory center are of special interest. 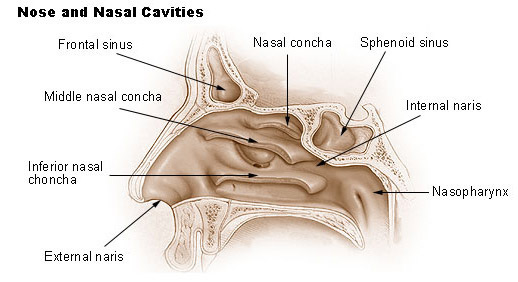 They are the rhythmicity area of the medulla and the pneumotaxic area of the pons. The medullary rhythmicity area includes two groups of neurons that extend the length of the medulla. They are called the dorsal respiratory group and the ventral respiratory group. The dorsal respiratory group is responsible for the basic rhythm of breathing. The neurons of this group emit bursts of impulses that signal the diaphragm and other inspiratory muscles to contract. The impulses of each burst begin weakly, increase in strength for about two seconds, and cease abruptly. The breathing muscles that contract in response to the impulses cause the volume of air entering the lungs to increase steadily. The neurons remain inactive while expiration occurs passively, and then they emit another burst of inspiratory impulses so that the inspiration-expiration cycle is repeated. 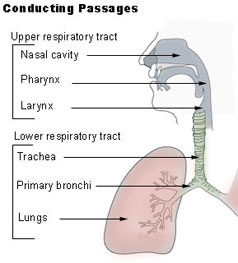 The ventral respiratory group is quiescent during normal breathing. However, when more forceful breathing is necessary, the neurons in this group generate impulses that increase inspiratory movements. There are chemosensistive areas within the respiratory center. These areas are located in the ventral portion of the medulla oblongata near the origins of the vagus nerves. They are very sensitive to changes in the blood concentrations of carbon dioxide and hydrogen ions. Thus, if the concentration of carbon dioxide or hydrogen ion rises, the chemosensitive areas signal the respiratory center, and the rate and depth of breathing are increased. Then, as a result of increase breathing rate, more carbon dioxide is lost in exhaled air, the blood concentrations of these substances are reduced, and the breathing rate decreases. Low blood oxygen seems to have little direct effect on the chemosensitive areas associated with the respiratory center. Instead, changes in the blood oxygen concentration are sensed by chemoreceptors in specialized structures called the carotid and aortic bodies, which are located in walls of certain large arteries (the carotid arteries and the aorta) in the neck and thorax. When these receptors are stimulated, impulses are transmitted to the respiratory center, and the breathing rate is increased. However, this mechanism is usually not triggered until the blood oxygen concentration reaches a very low level; thus, oxygen seems to play only a minor role in the control of normal respiration. An inflation reflex helps to regulate the depth of breathing. This reflex occurs when stretch receptors in the visceral pleura, bronchioles, and alveoli are stimulated as result of lung tissues being overstretched. The sensory impulses of this reflex travel via the vagus nerves to the pneumotaxic area of the respiratory center and cause the duration of inspiratory movements to shorten. 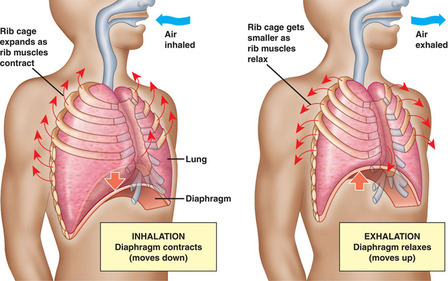 This action prevents over inflation of the lungs during forceful breathing. The partial pressure of oxygen in alveolar air is 100 mm Hg and that of blood is 40 mm Hg. Due to this difference in partial pressures oxygen diffuses from the lung to the capillaries. The pulmonary veins that collect this oxygenated blood has Poxygen of 95 mm Hg. The P carbon di oxide in the alveoli is 40mm Hg whereas that of the capillaries have 46 mm Hg. 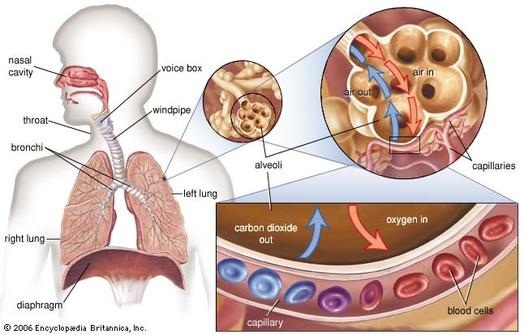 Due to this difference, carbon di oxide diffuses from capillaries to the alveoli. 1. Dissolved in the plasma. This accounts for very less amounts of oxygen. 2. 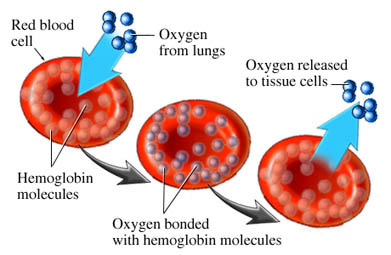 As Oxyhaemoglobin: oxygen diffuses into the RBC and combines with Fe ions of Haemoglobin to form oxyhaemoglobin. The decrease in O2 affinity of Hb when the pH of blood falls is called the Bohr effect. The amount of oxygen that can bind with Hb is determined by O2 tension. Percentage of Hb that is bound with O2 is called percent saturation of Hb. 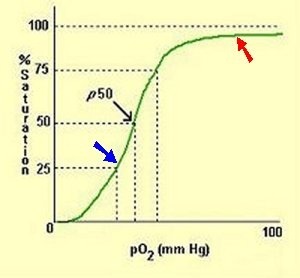 This percentage saturation of Hb with O2 is expressed graphically by a curve called the O2-Hb dissociation curve or O2 dissociation curve. This is sigmoid in shape. 1. 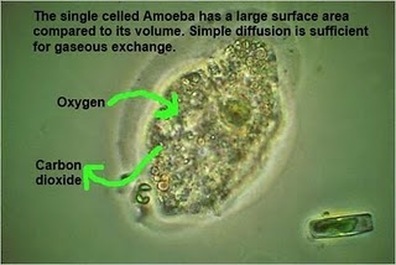 As simple solution dissolved in the plasma. 2. As bicarbonate – CO2 reacts with water to form carbonic acid, catalysed by carbonate anhydrase. Carbonic acid dissociates into bicarbonates and hydrogen ions. Hydrogen ions are picked up by proteins, some of the bicarbonate ions remain in the RBC whereas some comes out in the plasma. Chloride ions move in, this is called chloride shift or Hamburger shift. When deoxygenated blood reaches, the lung there is a difference in partial pressure of the CO2 in the lungs and the capillaries. A series of reactions also takes place as Hb takes up O2, the bicarbonate reacts with H+ and forms carbonic acid, which splits into CO2 and water. Binding of O2 with Hb tends to displace CO2 from the blood. This effect is called Haldane effect. Haldane effect results from the fact that combination of O2 with Hb causes Hb to be a stronger acid. Thus displaces CO2.